Figure A52. Maldives anomaly with (horizontal) [vertical] cross sections through (A)[D] the UUP07 p-wave) and (B)[D] the combined SL2013 and S40RTS s-wave models at 1510 km; C) the location of the modern geological record that we interpret to have formed during the subduction of the slab. is located below the northwestern Indian Ocean from the deep mantle up to the upper part of the lower mantle. In previous tomographic studies it has been referred to as the eastern part of the III anomaly (Van der Voo et al., 1999b) or as the IO anomaly (Hafkenscheid et al., 2006), and was interpreted to result from northward subduction within the Neotethys ocean. 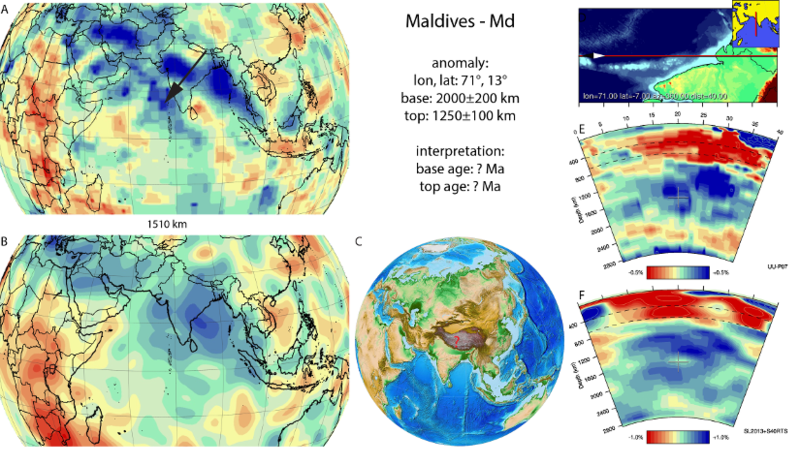 We now distinguish the deeper NW-SE trending Maldives anomaly from the shallower SW-NE Carlsberg slab (section 3.22) (Gaina et al., 2015), which were previously considered a single feature (van der Meer et al., 2010). van der Meer et al. (2010) interpreted an onset of subduction of this anomaly to occur as early as the Late Triassic comparing to reconstructions of Stampfli and Borel (2004), which we now consider unlikely given the adjacent Carlsberg, India, and Arabia slabs that subducted in Cretaceous time. More recently, the age of the Maldives slab was interpreted from geological evidence of intra-oceanic subduction from ophiolites found in the Indus-Yarlung suture zone, thrust on the Tibetan Himalaya (e.g., Spontang and Xigaze ophiolites) (Hébert et al., 2012). These were suggested to have formed at equatorial latitudes based on paleomagnetic data (Abrajevitch et al., 2005), and were interpreted to have thrust onto the Tibetan Himalaya around 70 Ma based on arrival of mafic debris in the Tibetan Himalayan stratigraphy around that time (Searle et al., 1997; Corfield et al., 2001). Because paleomagnetic data of the Tibetan Himalaya also show equatorial latitudes around 70 Ma (Patzelt et al., 1996), van Hinsbergen et al. (2012) linked the record of the Himalayan ophiolites to the Maldives anomaly. Recently, however, Garzanti and Hu (2015) demonstrated that the~70 Ma mafic debris in the Tibetan Himalaya is not ophiolite-derived, but related to plume volcanism, perhaps from early-stage volcanics of the Deccan traps. Ophiolite-derived debris did not arrive in the Tibetan Himalayan stratigraphy until the Early Eocene instead. In addition, Huang et al. (2015) showed that the Xigaze ophiolites are unconformably overlain by Tibet-derived forearc sediments with ages very close to the formation ages of the ophiolite (~130-125 Ma). In addition, they showed that the previous paleomagnetic data of Abrajevitch et al. (2005) were strongly affected by compaction-induced inclination shallowing, and provided a ~16.5°N paleolatitude for these ophiolites instead, i.e. immediately adjacent to the south Tibetan margin. Its current depth in the mantle is consistent with Cretaceous subduction, and when the global plate circuit (e.g., Seton et al., 2012) is cast in a hotspot reference frame (e.g., Doubrovine et al., 2012), the Maldives anomaly is located within the Neotethys ocean below the India-Arabia plate boundary. At this plate boundary, there is evidence of subduction farther south, culminating in obduction of the Waziristan-Khost ophiolite onto Arabia around 80 Ma (e.g., Gaina et al., 2015). The nearest record of intra-oceanic subduction may be the Kohistan arc, and Jagoutz et al. (2015) argued for a low latitude of Cretaceous subduction below this arc. Borneman et al. (2015), however, documented Asia-derived detritus from Cretaceous sandstones within the Kohistan stratigraphy, arguing against such a scenario. At this stage, we therefore refrain from interpreting a geological record of subduction for the Maldives anomaly.